This year has been difficult for me. Somehow I have felt out of "sync", like I have been a little off and not able to do anything. I know that I have done some things, am I just doing less and that is the problem. Am I not doing "everything" that I feel I should, so I feel like I do nothing? It is a hard thing to face and to figure what I can do to bring myself out of it. On the whole, I look at my life with a smile and so thankful for everything and everybody around me. I am so blessed to have been able to do so much. Why do I feel I am not able to do enough? Do I have a deep down feeling that I need to do more to "repay" the world for giving me such a good life? Am I just thinking too much? Are the American politics just wearing me down? When I was taking pictures and posting earlier this year, I seem to have been doing a great deal and having a wonderful time. But this fall I have been slower at recognizing the joy in my life. I need to get my joy back and enjoy life. In September our season tickets to the Utah Symphony/Opera started and I have loved being able to listen to live music. I have been able to hear pieces that are well known to me and be introduced to new music to learn about. Utah Opera productions seem to get better each year. Romeo and Juliet was not my favorite over the past couple of years, but the voices that they bring in are fantastic and I enjoy the sets and production. In October I was able to take a workshop from Bonnie Inouye and it was fantastic. She is so knowledgeable and I have been wanting to take a workshop from her for a while. This one was Big Twill and she introduced a few things in ways I had never thought about before. Look at the cool movement in her sampler. Her workshop was a continuation of the interest that I have in the "Echo and Iris" book and the techniques covered in it. I had some classes and a workshop in Reno this summer that fell under that study heading and this workshop added to the knowledge I have acquired. I had two self study directions that I tried this year. "Echo and Iris" was one and the other is crackle. I have been working on a sampler exploring the structure of crackle. I have woven it before, but I wanted to really understand the possibilities. I am not sure that I have it down yet, but I will finish that sampler and move on to a couple of projects to try learning more I plan to continue the crackle study next year and will be taking a workshop from Susan Wilson to help me learn more. So one of the first things to do in the new year is to finish the crackle sampler. I will also continue the echo and iris study line in the next year. I have a couple of projects that I want to put one to extend my understanding of the four color work. I want to understand a little about picking colors out to make the design look iridescent. I worked through some of the book when I was doing some double weave this summer in the Spady class, but there is so much more in that book. I hope to do a four color piece on the crackle sampler, I like the turned crackle and want to see how it can be done to give the iridescence. I have worked to empty some looms. The big push was to get the RH looms empty and put away. I have three done and one to go. I need to spend less time on the internet and more time on my weaving. I have a lot of plans and need to work a little harder on "follow through". 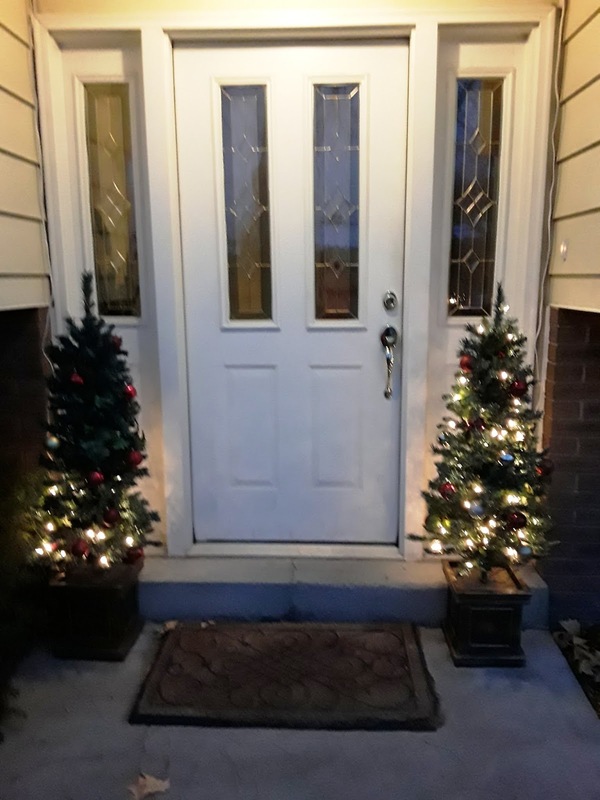 This year, Christmas was the year of the bad lights. I had one garland with the center lights out. I replaced it with an led set. I hope this garland lasts longer. I have four garlands on top of three of the bookshelves/cabinets in the house and one on the stairs coming into the house. 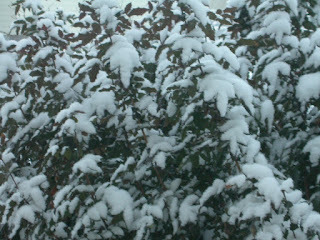 We have a couple of small trees outside by the front door. This year the lights did this. There must have been a short in that section of the tree lights, because every one of the bulbs was burned out. My husband found the look very disturbing so he bought a small string of lights and wrapped them over the top of the tree. The trees looked great for about a week, then the other tree did the same thing. My DH bought another string of lights and wrapped them on top of that tree. Now the bottoms of the two trees are out. Like I said a bad year for lights. I had my DH buy two additional strings of lights, so I can strip down these trees and relight them and put new colored ornaments on them. 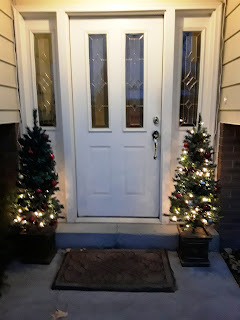 The beautiful red ornaments that I originally put on these trees have faded to an orange color so it is time to re-do them. So that is another project for me to do after the 12 days of Christmas when we take down the greenery. My life continues like everyone else, some days are good, some days are better than most and some days we are just getting by. I started getting a list together of how much each of my looms have been doing this year, but it just got stuck and never made any progress. So I abandoned the list, my looms have been working, but I don't know exactly how much. I was disappointed that the yardage did not come off the Big Mac before the end of the year. But a couple of weeks in I finished it. 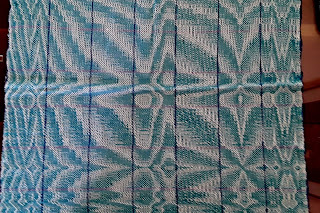 I was not able to find any weft to continue the fabric, so I did a slightly different color for the last yard, maybe it will work for a companion piece or trim on the original. On the right side is the original stripe with the very bright handspun (about 2 yards) in the center is the coordinating fabric (about 3 yards and on the left is the extra fabric (about 1 yard). 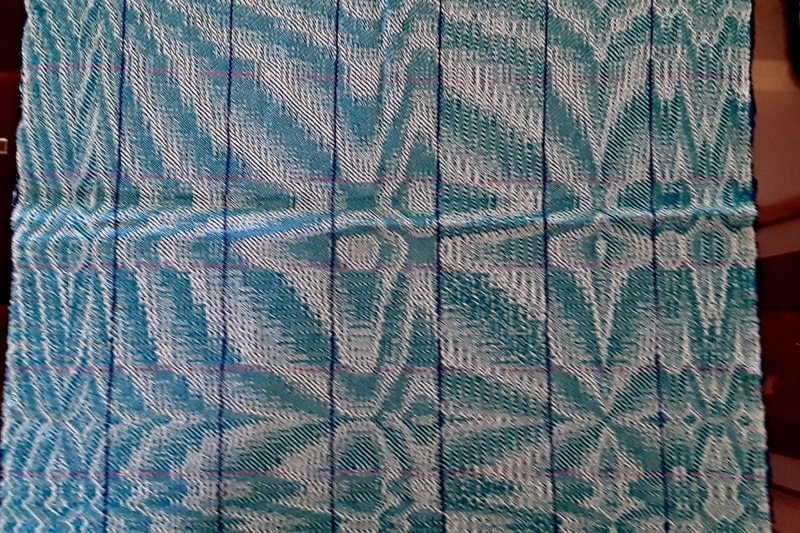 The original two fabrics have a peacock yarn for the warp and weft, and the extra fabric ended up with bottle green for the weft. I think it made a good fabric and I hope I can come up with a good piece of clothing. I have started to be satisfied if I get two or three of the things taken care of. I try not to feel bad if I don't finish the "To Do" list. Instead at the end of the day I try to look at what I did manage to get done. Usually I am very satisfied with the list I was able to do, and I try not to just look at what I did not get done. I warped my three rigid heddle looms for a video class, then decided I needed a fourth example and bought a Baby Cricket (10") and warped her up. I have not got any of the projects off the loom. But the one that did badly in the class, I resleyed it and got a good sample going. I think it will be used for small zipper bags. I need to get things done to try to have for sales. Now the boundweave is covering the warp! I think I will be much happier with this structure. I did some small bags with this type of boundweave on a rigid heddle loom years ago and I liked the look and feel of them. I have been binge watching too much Netflix. I think it is an avoidance technique. But while I am watching, I keep my hand busy doing stitchery. Things I have not done for a number of years. It has been fun. There are a couple of counted cross projects that I have started, but the things I have finished are quite an odd group. To top it all off, last fall when I was in Harrisville, I bought a pot holder loom. You know, the kind we all made potholders from sock loops when we were young. This is the Pro-sized and makes bigger potholders. I made about 30 of them! I went crazy with color and weave patterns. What am I going to do with so many potholders. At our Sister's Date in January, I let everyone pick out a couple for them to use, so I am down about 8...but that is still a lot of potholders! Yesterday my husband changed the calendars. I guess he is ready for the year to be over. I wanted to wait, because I wanted to finish weaving the warp on my Big Mac before the year was out. I have been weaving, but ran into a snag. As you can see, it was a sorry sight. 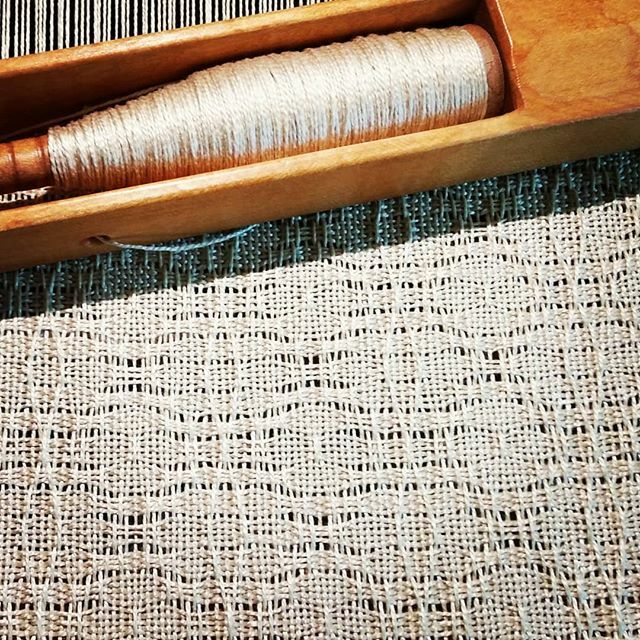 I decided a couple months ago to clean around, on and under the loom, and clear space so I could sit down and weave. It was a goal to get it off the loom before another year had passed. I have been weaving and really enjoying using this loom again. I finished a couple of yards with the handspun accent yarn, then started the yardage without the handspun. This is a draft of a fabric from Linton Textiles and I think I had plans for a jacket and skirt. The plain yardage still shows the floats where the handspun was. I always planned to make the companion yardage (to the handspun) with the same treadling so that the floats would give it texture. I really like the way it worked out. But I ran out of weft yarn. There is at least a yard of warp left. I have finished a large number of weavings, and I have started (and even finished) some sitichery pieces. I did not knit so many socks this year, but have done knitting. This summer I got a pro-sized potholder loom from Harrisville Designs and I have made more than a dozen potholders...it has been fun. I need to get them to my family and have them pick their favorite...I can't use that many! I have started some alpaca ponchos. This is a test to see if I can make them cheaply enough to sell (I need to see if I can make them to sell wholesale to the grower). 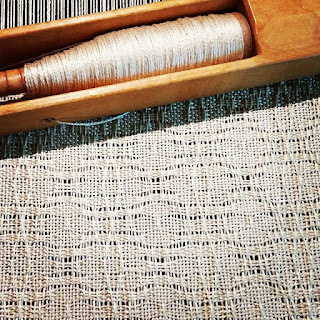 It is tough to do, I keep track of my time for warping, weaving and finishing the projects then see if she feels that she can make money on it. The fabric is beautiful, but it seems to be taking too much time. I may need to check the white balance on the camera. Both pictures are the same yardage, but taken under different light. Happy New Year to everyone. I hope the love and the joy of the holiday season follows you throughout the new year. Christmas, end of the year, winter solstice...It's that time of year. I find myself so emotional about everything; teary at commercials, sad (or happy) stories. I wonder what makes me feel this way. I feel that I have not got as much done as I should, my "work ethic" is not up to par, I just want to curl up in bed with the heater on. I should be happier. but it is such an emotional time. I feel like I need a new start, a new direction, a new year. I guess I do have one of those starting up...let's see if I can do something with it.